Slowly but surely I am catching up to my monthly charitable donations. My May Donation is for the ASPCA. I am sure we have all seen the commericals with Sarah Mclachlan in them that tear at your heart strings (i might just cry typing this). As I have said before I am a sucker when it comes to caring for animals. The ASPCA seems like an obvious choice. My June donation is for the Garfield Conservatory in Lincoln Park. Last year they suffered a devistating blow when a hail storm knocked out a large portion of the windows at the conservatory. The Convervatory has always been one of my favorite places to visit whenver I went to the Lincoln Park Zoo. I have always found greenhouses and conservatories incredibly calming. So warm and quiet inside. I often times went to the green houses at University of Illinois when I was there during the winter just to escape the cold and drab weather and the stresses of the school. They were an incredibly meditative place in all of thecrazy that is sometimes a college campus. So I have totally dropped the ball on updating my donations for the past couple of months, but I plan to get back up to speed on that. My April donation is to Rolling Dog Ranch. Rolling Dog Ranch is a rescue ranch for disabled dogs and horses. 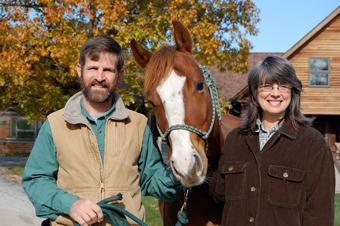 Rolling Dog Farm rescues and shelters disabled dogs and horses. They come to us from humane societies, animal control shelters and rescue groups across the country, literally from coast to coast. Every animal who arrives at the farm gets another chance to have a safe and loving home. Most of our dogs are blind, while some are blind and deaf, and others have neurological and orthopedic issues. Our horses are blind. Although these animals may have disabilities, they do not consider themselves handicapped. They just want to get on with life and enjoy themselves. This month's donation goes to The Water Project. 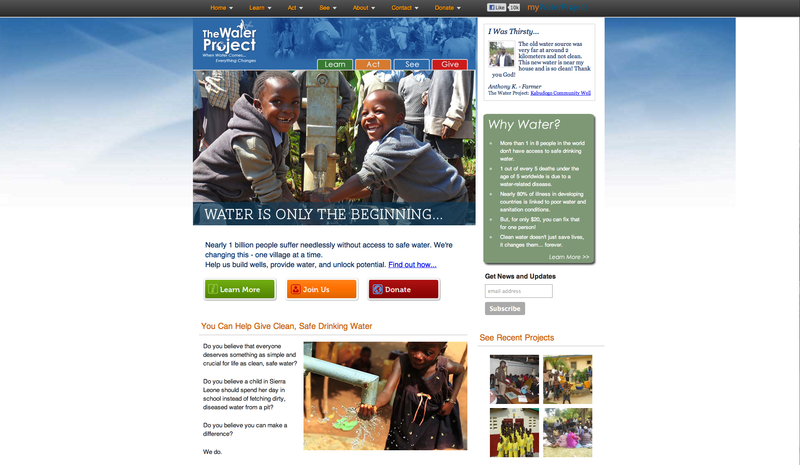 It is an organization online that helps to bring clean water to people living in rural Africa. Nearly one billion people have no access to clean, safe water. The dirty water they do have makes them sick. It robs children of hope. But it doesn't have to be that way. We know that access to clean, safe water changes lives. We know that when a well is installed for a village, girls return to school. Women begin small businesses. Men are no longer too sick to work. Fields are watered and food supply becomes more reliable. Health returns and children grow up to be productive members of their community. The cycle of poverty is broken. Lives change. Access to clean, safe water isn't an end, it's a means. The money you donate can go to a couple of different projects depending upon what you chose, but it mostly goes directly to building wells in Africa to allow people access to clean water. After the donation the website will provide you a link with information and the location of the well you are heloing to build. The well that my funds were donated to was Rwanda Well #3043. If you would like to donate, get involved in other ways or just find out more information head on over to their main site at TheWaterProject.org or over to their "Get Involved Page"